I CAN’T BELIEVE THAT YOU DONT’ BELIEVE THAT I WRITE A BLOG! IT’S THE BEST KEPT SECRET IN TOWN BECAUSE MY MOM DOESN’T KNOW THAT I USE HER COMPUTER. RIGHT NOW SHE’S IN YOGA SO WHILE SHE’S DOING HANDSTANDS I’M TYPING AWAY! WRITING MY POST TO ALEX. 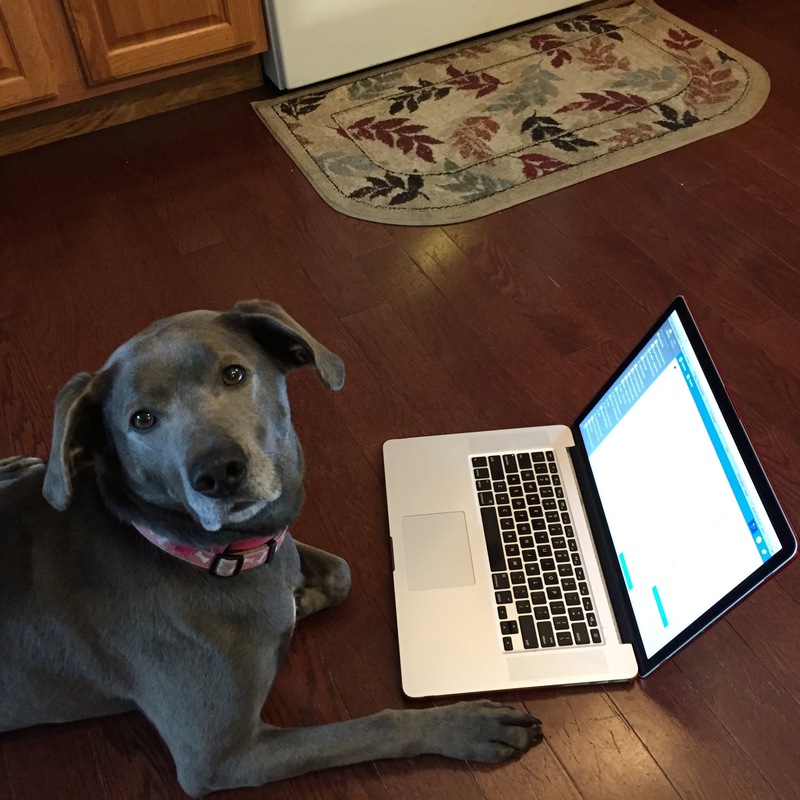 DO YOU NOT THINK THAT DOGS HAVE SOMETHING TO WRITE ABOUT? DON’T YOU THINK WE HAVE FEELINGS? THERE ARE SO MANY ISSUES THAT I PERSONALLY HAVE AND I THINK THE WORLD NEEDS TO KNOW ABOUT THEM. HOPEFULLY IT WILL HELP OTHER DOGS FEEL LIKE THEY HAVE A VOICE. SO IN ORDER TO GET YOU INVOLVED WITH MY BLOG, I’D LIKE TO INTERVIEW YOU. IS THAT OK? 1. DO YOU LIKE DOGS? 3. IF YES, WHAT KIND OF DOG DO YOU HAVE? 4. IF NO, WHAT KIND OF DOG WOULD YOU WANT AND WHAT WOULD YOU NAME HIM/HER? 5. CAN YOU SEND ME A PHOTO OF YOU AND MY BROTHER, STEPHEN, HANGING OUT AT SCHOOL? I HOPE YOU WILL RESPOND AND SHOW THIS DOG SOME RESPECT! My mom left to take Nanny (her mom) to the doctor’s. I turned Mom’s space heater on in her office to warm up the place. It’s so cold for Nanny to go out on her own and it’s nice to get right into a warm car. It’s like when I go pee outside in this freezing weather and then come back into our cozy home. I hate being cold and I’m sure Nanny doesn’t like it either! 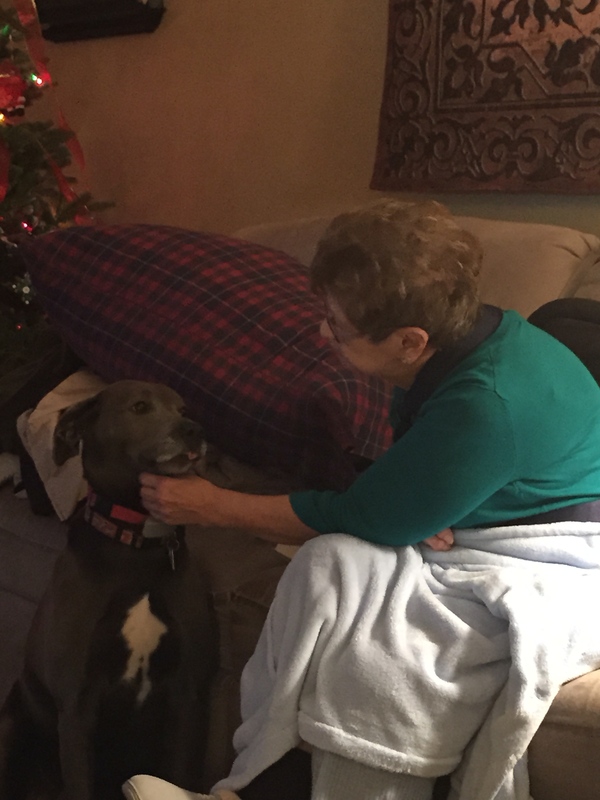 Since I started writing about Nanny, let me tell you about my four days as her therapy dog. A few days before Christmas Nanny stayed with us because she hurt her arm. She couldn’t move it, so it would be easier for Mom to take care of Nanny at our house. Well, of course I was excited! So was Dakota, but I gave Nanny my best smile and wagged my tail super fast. I’m sure she knew how happy I was to see her. It was very hard to calm down, but then Nanny would sit on the couch and pet me while I leaned against her leg. This is when the therapy began. While Nanny and Mom watched holiday movies I would lick Nanny’s hand and she would pet my head and watch the movie. I think it helped her heal and calmed her. I know she had a lot to get done before Christmas, but she needed time to relax. I take my therapy job very seriously. See how hard I’m working? Barely awake, Nanny would rest her hand on my head and sometimes she would even fall asleep like that. That’s when I would lay down next to her just to make sure that Dakota didn’t stick his long nose in her face. Nanny loves Dakota, too. I know because she fed him pieces of her toast from the table! Shhh! Don’t tell my dad! Dakota was extra gentle. I’m proud of him because he can be nippy and klutzy. I made sure I took care of Nanny, but she also took care of me and Dakota, making us feel extra loved. I hope Nanny knows there’s always a place petting my head and I’m happy to be her therapy dog any day!